TopCashBack has another great freebie for new members who have not gotten a freebie before! 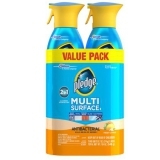 This time, you can get a 2-pack of Pledge Multi Surface cleaner for FREE! You could use $500 right about now! Today is your lucky day! Your entry for Everyday Winner's $500 giveaway needs confirming. Click to confirm your entry now!